I had to drop everything but the camera this afternoon and run down to the shore to catch the sunset. One of the lesser known benefits of November is the quality of the sunsets we are blessed to enjoy. Offset by the snow along the shore and on the raft, the lakes were ablaze with fiery colours. I wasn't alone at the lake enjoying the view. A small flock of buffleheads drew a line of fire in their wake as they crossed the bay. It was quite extraordinary how the ripple they left caught the sunset colours. They kept this fiery wake after they moved out of the reflection of the trees -- although at that point it was a lot easier to see the ducks themselves! The thing about sunsets is how fleeting the colours are -- they change constantly, so I took plenty of photos! It is such a beautiful world we live in. Amazing how it can be all cool whites and blues in the afternoon, and suddenly turn into this blaze of reds, mauves, oranges, even if only briefly. It's a reminder that we should always be ready to take a moment, stop, be quiet, and let our souls catch up. Labels: Sunset. Lake of Bays. Buffleheads. Bondi Village REsort. While our American neighbours were dashing about spending money on what is known as 'Black Friday', Cindy and Paul were here at Bondi, enjoying the peace and quiet -- and the snow! It was a most White Friday up here! They dropped into Deerhurst, just to check out the pub, and found themselves transported. The 32nd Annual Central Ontario Bluegrass Awards were taking place -- as they do on this weekend every year. The place was just jumping with musicians. Sitting, listening, they found themselves enfolded into the 'family' that is the Bluegrass tradition. As old friends arrived, instruments in hand, the place filled up with cheery greetings and even cheerier music, everybody taking part, just jamming. A gentleman came to sit next to Paul. "See that guy over there? He's the best guitar player in the world." It was a warm, welcoming occasion, and it blew our guests away. They came back just raving about the experience. The Central Ontario Bluegrass Association is dedicated to the preservation and promotion of Bluegrass and Old-time music throughout Central Canada. If you aren't familiar with Bluegrass, you can give a little listen to Concession 23, one of MANY groups performing at the awards at Deerhurst. Who knew??? Put this on your calendar for next year. It's a great time for everyone. Labels: Northern Ontario Bluegrass Association. Central Ontario Bluegrass Association Awards 2010. 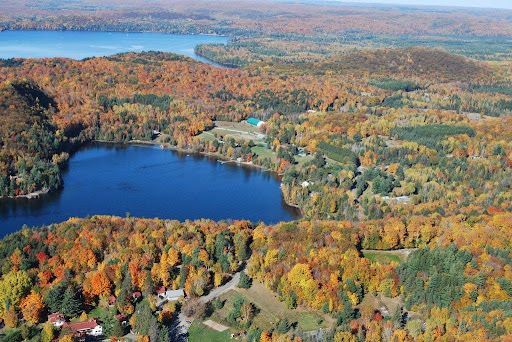 Deerhurst. Lake of Bays. How much did it Snow? Just getting to the shovels and snowblowers was a challenge. Before the horses could go outside, doors had to be shovelled clear. Squeegee would have preferred if we'd shovelled out his whole paddock, I'm sure. The 'big kids' were revelling in the snow. They couldn't wait to get down and roll in it, sending up snow showers of their own. It is good for their feet and legs, and certainly got two ears up from Blizzard, who has been lamenting the very hard frozen and uneven ground. He likes this much better! Brian was in Novar, so David took over with the small snowblower, and gradually, bit by bit, things emerged. Like buildings... and walkways... who knew? So how much snow? Almost 17"... It's truly amazing how swiftly the roads and driveways get cleared -- that's because unlike the city, we have someplace to put snow as we clear it, and we are expecting it, so there are trucks at the ready. Still, it's amazing that the place can vanish under crisp clean drifts during the night, and the roads are clear by the morning. This is great news for the ski hills -- Hidden Valley has their snow guns running flat out, and equipment is grooming the hills. Skiers can't wait! Labels: snow event. Bondi Resort. Family Vacations. Christmas vacations Ontario. Lake of Bays. Yesterday, the wind was chill, and the ground was frozen hard, but the lawns were still faintly green. This morning, early, there was a dusting of snow. And a warning on the Weather Channel that winter was on the way. How true! It's Black Friday in the States. Evidently White Friday up here in Gods' Country. It's American Thanksgiving. I'm thankful. I'm thankful I live in a wonderful country, that I have great friends and family, that we get weather that never lets us get bored or complacent, that I have a warm house, and an indoor arena for the horses, and a fireplace for the cats... Our American guests arrived Thursday. They're joining us for dinner tomorrow, and enjoying the beauty of the snow. It's beginning to look a LOT like Christmas out there! Labels: snowfall Lake of Bays. The theme for the Oakhurst Girls' Getaway Weekend this year was the '80s. The clothes were amazing -- we don't need to take you back there, through the headbands, punky hairdos, leg warmers, shoulder pads, but the Babes had it all happening! Hopefully they'll send us some photos! Every year, we go for a long hike in the woods. This year the weather was clear and crisp, and we meandered past the solar array, through the cross country course, sugar bush and hemlock forest. We found a LOT of trees with bearclaw marks on them. One hemlock that had been struck by lightning and almost exploded. Fungus, mushrooms, puffballs were all still out there, despite the lateness of the season. The deer were all on the lawn, however -- we didn't see any in the bush. We did find some very endearing icicles, clinging to the northern mossy slope of the rocks. It's always beautiful in the woods, no matter what the season, and there is always something unusual, extraordinary and worthwhile to be found out there. We look forward to their visit every year. It lets them take a breath after a long season of competition and training with their horses at Oakhurst Farm, before we all move into the hectic Christmas season. We've had a great November, in the weather department. Here we are, almost through the month, and I have yet to break out heavy coats and boots. That's going to change. We look to our western neighbours, who are still shovelling snow and wondering what happened to their fabled Chinook, and we know the snow is going to be moving our way. That's okay. It's hard to ski or snowshoe or play with the season if you don't have snow. The season is almost here. We've still got some vacancies, especially if you've got kids who are out of school until January 10th this year -- we're a great place to come to let them play with the outside gear they get for Christmas, or to let them use our toboggans, snow and great outdoors! Well, it's happened. We ate roadkill. Jeff Foxworthy should be giving us a phone call any day now. It came about in the most innocent of fashions. Let's set the scene. Carol was putting up Christmas decorations at the main gate. Chickens were happily scratching about in the fallen leaves, on both sides of the road. School bus was approaching, at some pace, on the way home for the end of the day. Young, foolish chicken leapt off the bank on the far side of the road and landed smack dab on the front bumper of the bus. Wham. This, oh dearly beloved, is why we teach our children to stop and look both ways. It does not, regretably, answer the question of why the chicken crossed the road. Carol, who grew up in Brazil and had a brief but stellar career as a small child helping prepare the chickens for the stew pot, scooped up the still fluttering pile of feathers. 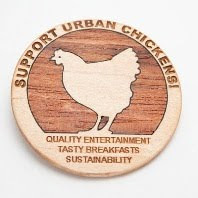 Now, while I am quite attached to the gals in the barn, and cannot bring myself to dismiss any of them for the simple sin of growing old and stopping egg production, I have no problem with a chicken that has committed suicide. It seemed a shame to waste it. Which is how we came to be eating a bowl of chicken soup, with Bondi grown potatoes, carrots, leeks, parsley and -- yes -- chicken. It was excellent. David's working in Huntsville for a Surveyor as part of his College work-term. When he told them, the office came to a standstill, collapsing in laughter. "You ate roadkill!" Friends dropped by today (the purpose of the trip was ostensibly to do some Christmas shopping, loading up on Napster cards!). They sent along this great shot of Achmed, surveying his 'beat' and keeping his world in order. It's almost 3 years since Achmed arrived, storming through the cat-flap into the house at 3 a.m. to get in a scuffle with resident cat Napster. The two now get on quite well, with just the occasional scuffle over who gets the couch. 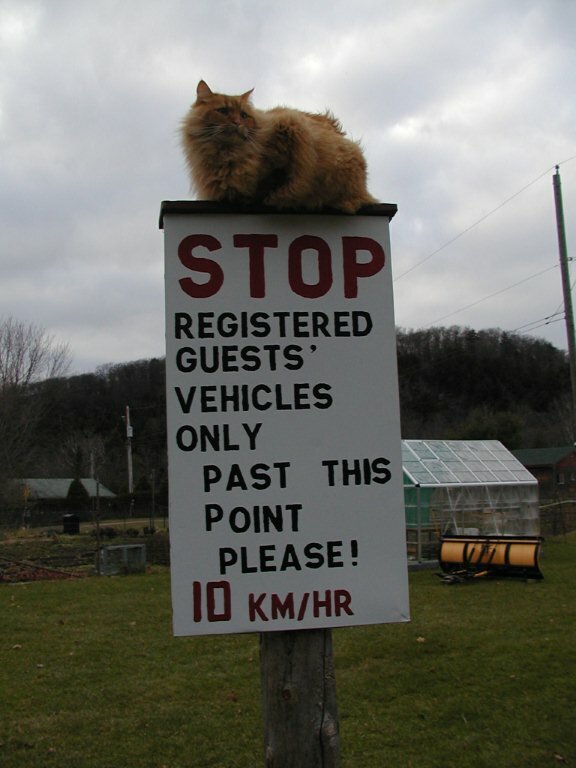 But Achmed hasn't lost his taste for high places, and he takes his duties as Surveillance Cat very seriously indeed. Labels: cat. 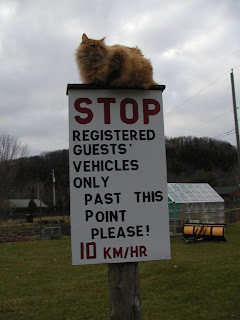 traffic sign. north Muskoka resort. Winter vacations in Ontario. Brian sent us this photo, taken from 10,000 feet up, on one of his last flights in his Piper Cub PA11 last month. That's us in the middle... Bondi is the horseshoe shaped bay just right of centre. Fire Island is clearly visible, as is the long L-shape of Haystack Bay that leads to us. Dwight Bay is just above our bay. In the top left hand you can just see Peninsula Lake, across the narrow divide of the Portage where the little Portage Flyer train used to run. This photo, taken from a lower altitude, looks the other way. That's Ten Mile Bay in the background, and the Narrows leading into Dorset at the top right edge of the picture. Even with the leaves down ad the forest carpet looking almost ghostly, Lake of Bays is a jewel in the landscape. We think that one of the best ways to appreciate the beauty of this area takes place when we look at it from this high perspective. Brian, as a pilot, couldn't agree more. Labels: Ten Mile Bay. Lake of Bays. Dwight. Bondi Village. Aerial photos. Gerry was here on the weekend with his family and their two dogs. He was also here with his camera, which is WAY better than my own! 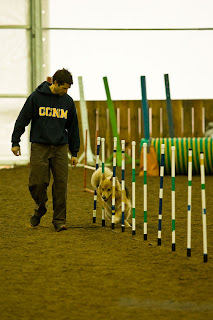 He sent these pictures along -- one is taken in our arena: Lowell and his 'northern rescue dog' acing it through the weave poles. The rest are taken last summer, outside in the sunshine. The expressions on the dogs' faces are marvellous! Thanks Gerry! And by the by, your dog Hogan is looking pretty intense on the 'catwalk! This post comes from Brian, who has been tromping about in the woods lately getting the ski trails ready for winter. Which by the by started to arrive tonight. Readers should be advised that the photo (at the bottom of the post) is not very PRETTY... for reasons that become obvious as you read the post. "Well here is the story, and I am not kidding... I never kid you guys on things like this. I was out on the trails this aftenoon clearing off the fallen trees from the late fall storms so that they would be ready to groom when the snow arrives. Back in the swamp trail, I came around a corner and there in a sunny patch was a big wolf. We eyed each other for a bit, he looked well fed and I had a chainsaw so having watched the "Texas Chainsaw Massacre" movie I felt I had the upper hand here. Anyway, I wondered why Mr. Wolf did not want to run away like they usually do. Well a little investigation showed that he was busy eating a dead deer about 30 feet off the side of the trail and I was disturbing his lunch it seemed. It was (and was is the operative word here) a good size 6 point buck. The rack was about all that was any good to me so the wolf and I did a little negotiating. I pointed out that I had the chainsaw and he agreed to let me have the head with rack if I promised to move on and let him eat the rest of his meal. I thought this was a good arrangement, so I sawed the head off and brought it home with me and I assume the wolf is full by now and snoozing somewhere. 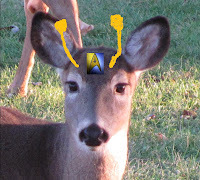 I had no camera to take pictures of the wolf, but once home I took a picture of the deer head. A bit gnarly but a few months outside in the sun and all the meat should be gone. I'll mount the rack somewhere in the spring I suppose." To which we add that it seems a waste to just leave the antlers lying in the woods... and keeping in mind that we do co-habit with a pack of Algonquin timber wolves, we do from time to time, find "left-overs" so we are not perhaps as squeamish as some about this. 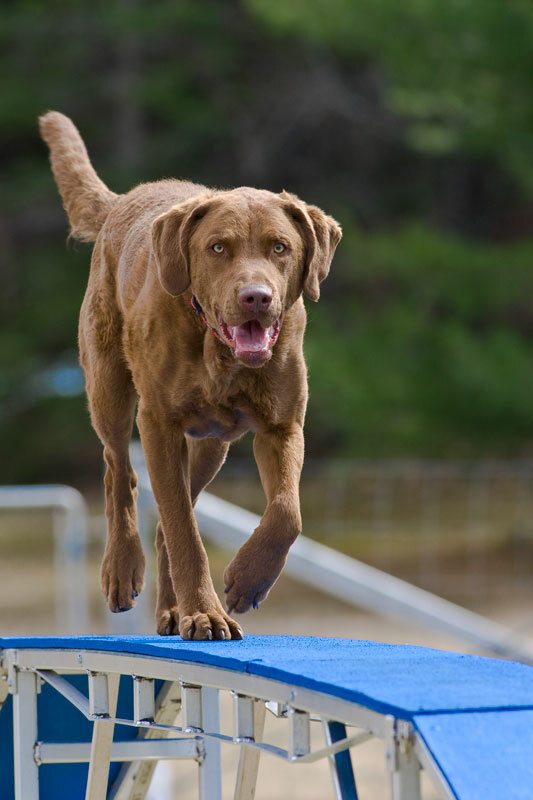 Today the Muskoka Agility Dogs were here, in the indoor arena. It worked out well for the group -- outside it was rainy and cold. Even the chickens gave today a 'wings down' and hung out in the stable most of the day. Inside it was temperate, bright, busy, and barking. Dogs of all sizes, shapes, breeds and experience were there, from the Northern Rescue Dog from north of Mattawa to the aristocratic Gordon Setter, the "all ears" Papillon, to the "all eyes" tiny beagle cross who never once took her attention off her handler. 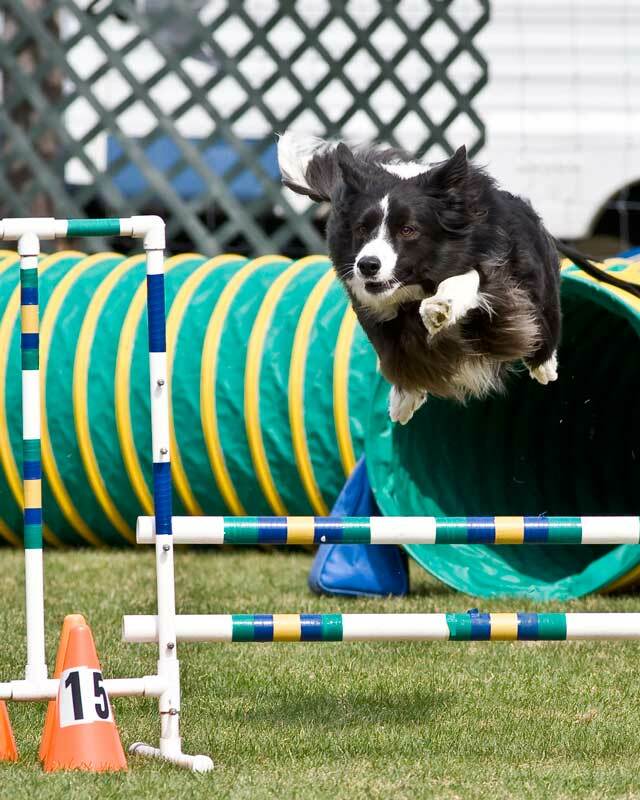 Dog agility is growing in popularity -- and it's easy to see why. Dogs need to be socialized, well trained, and active, just to be happy and popular in general life. Agility hands them all of that, keeps them active in mind and body, and allows their people to interact with their dogs at a whole new level from sedately parading once around the block. 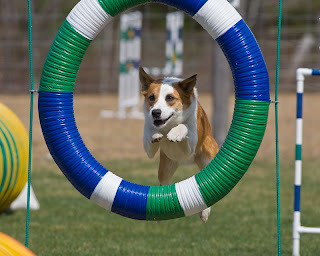 The dogs work from voice and hand signals, and learn how to negotiate series of obstacles that include teeter-totters, A-frame climbing walls, tire jumps, regular jumps, straight and curved tunnels, and weave poles. In competition it gets fast and furious... in training, it's all fun and games, repetition and rewards. When Lance wanted to stop on top of the A-frame and survey the scene, or when Bandit the Tunnel specialist decided to put on a cheeky demonstration of how quickly he could avoid the tunnel today, nobody minded at all. When dogs of handlers 'got it tangled', they quietly went back and repeated the exercise, made it simpler, made it slower, sorted it out, and then stepped it up again. The MAD plan to be here once a month this winter, allowing the enthusiasts the chance to keep their dogs working on the equipment. For some, it will be stepping stone to competition -- both Club Matches, Fun Matches and more serious high level competitions. For others, it's just for the fun of working with their dogs. For the dogs, it's all about the game. The horses can relate to that! And take note that it's the country that arrives, not the wilderness... so be sure to get the family up to this part of the world, out into the provincial parks such as Algonquin, so they know more about their world than just concrete and video feed. The horse show is always exciting, and you can do all your Christmas shopping in the trade stalls, but be sure to get out to the rest of the Royal, to see the chickens, rabbits, ducks, sheep, goats, cows... to listen to some of the auctioneers in action, to meander through the displays of vegetables, and farm equipment, say 'thanks' to a farmer, sample the foods of the world, and just be happy that we have this magnificent diverse "country" that can pack up and visit the City each November! Tuesday, Brian and I were at Deerhurst Resort, meeting with the travel counsellors for Ontario Travel and Tourism, the good folks that greet people at the tourism centres throughout the province. OTIC (Ontario Travel Information Centres) was well represented, along with OTMPC (Ontario Tourism Marketing Partnership Corporation) and the Ontario Accommodation Association. We had the chance to introduce them to Bondi -- what we are, who we are, where we are. Some were old friends, who have visited us on Fam Tours to familiarize them with area properties. Some were new friends. There were a lot of Ontario Attractions there as well, including the CN Tower, Niagara, Science Centre and the R.S. McLaughlin historic home, Parkwood. Other resorts were there with us, and it was good to interact with them, as well as with the travel professionals. Ontario truly does have plenty for everyone, and we're proud to be part of that! And there really is No Place Like This! 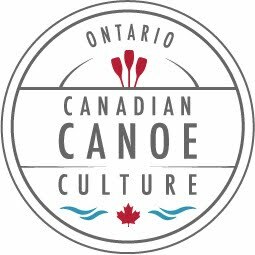 Labels: Ontario Tourism. Ontario Accommodation Association. One of our favourite birds has been back with us this week, taking advantage of the wild plums on the tree by my house. The Cedar Waxwing, described as a silky, shiny collection of brown, gray and lemon-yellow, accented with a subdued crest, vivid yellow trim on the tail feathers, rakish black mask, and brilliant-red wax droplets on the wing feathers. They always come in a flock, filling the air with their thin, high whistles. Very co-operative, these birds during courtship During courtship the male and female will sit together and pass small objects back and forth, such as flower petals or an insect. Mating pairs will sometimes rub their beaks together affectionately. They are not not territorial, although they will pair off during mating season, they usually still remain in the good sized flocks, feeding amicably together. Fond of edge habitat, shallow water, and fruiting trees, there is lots for them to like around Bondi, and we are frequently graced by their presence. When the wild choke-cherry trees are in fruit, it is very common to suddenly find the tree filled with a passing flock of waxwings. 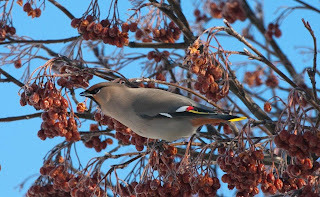 Since these berries can become over-ripe and ferment, occasionally the birds get 'drunk' on the fruit, creating erratic flight patterns. Oh, and that lovely band of yellow at the edge of the tail? If they are eating a lot of honeysuckle when those feathers are growing, the colour comes in a glorious orange. Very elegant indeed! Labels: cedar waxwings. Bondi Village REsort. Lake of Bays. bird watching Ontario. It’s an honour to welcome you here today on behalf of the Lake of Bays, to this wonderful memorial built by our community members. A place that allows us to hold these memories close. The history channel recently aired a documentary on the Somme. Long ago. Far away. Pouring over old film footage, soldiers coming up out of the trenches, we were told this was perhaps the first recorded images of soldiers falling in battle. Ever since then, that is mostly how we have seen our wars – through a lens. Distant. Without the sound, the smell, the shaking in the bones. For most of us, war is far away. People get older, memories get fragile, war becomes something that happened far away in time, far away in place. Blessedly, for most of us, war is something that belongs to someone else. We have stories told to us by parents or grandparents – I remember my own mother’s version of standing under a bomber’s moon near London watching the 1000 bomber raid take flight, filling the sky in all directions, shaking the ground, for two solid hours as the planes headed for the continent. 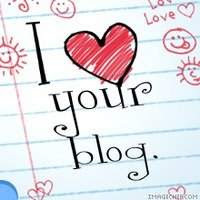 I heard that story, looked at photos, watched movies, but it wasn’t MY story, it happened Far Away. For the people to whom those wars were far too close, well, every year there are less of them as time marches on relentlessly. It’s easy to forget. It’s easy to take what we have today for granted. Most of us – again, blessedly – have never been the ones on the sharp end. Gratitude can fade along with memory. But the price of the freedoms we enjoy is vigilance. Remembrance Day ceremonies, are so important. Not just to honour memories of the sacrifices made, and thank Veterans who remain, but to remind us that war is not so distant as we might think. We are still at war today, all around this globe, with courageous men and women in uniform, and their families waiting at home. We complain about the amount spent on security, yet we send our people into harm’s way, to places we would never go, to do a job we cannot do. While the people who once fought in the trenches at the Somme, or stormed the beaches on D-Day... while they grow fewer in our midst and their memories fade like the sound of those bombers droning out across the Channel while my mother watched, we have now a highway named for Heroes. We have wars happening in our living rooms, brought to us from places Far Away, and somehow unreal on the television screen. This moment, Remembrance Day, is the time when we stand still and let the world spin without us, for a few precious moments, to honour those who paid for our freedom, paid for our peace, with their lives. To thank those still out there, wearing our flag, fighting our battles, paying the price that we may continue in peace and security, keeping the wars far away from Canadian soil. This is when we remember that Peace comes with a price, and can never be taken for granted. This is when we remember that for many of us, for our friends and neighbours, with parents, siblings and children in uniform on our behalf, the wars we fight now are as close as it is possible to get. This is the moment when we hold them all Close – in our memories, in our minds, in our hearts -- and must never forget. It should not just be for one day, for two minutes, that we give thanks for this country and the freedoms we enjoy. To the end, to the end, they remain." Labels: Remembrance Day. Dwight Cenotaph. Lake of Bays. Such changeable weather, come November. Mist hangs over the lakes, because the water is warmer than the air. That won't last long however! We get visits from the migrating birds such as the buffleheads. We get bright sunny days. We get rain, endless sheets of gray. Snow, white and sparkling and wet. David's a huge fan of the snow. He dragged us off tonight to the Warren Miller film WINTERVENTION, a great evening of watching people ski off vertical drops in the most bizarre locations in the world. Great scenery... even greater snow. The folks in that film live to ski. Mike, who is currently out in B.C. anxiously watching the mountains for the first crowns of fresh powder, would understand. Labels: Warren Miller. Wintervention. Heli-skiing. Pirates and Ghosts and Tricks and Treats! Living out in the country, we don't get visited by a huge number of spooky treat-seekers on Hallowe'en, but what we lack in quantity is made up by quality. About a dozen 'creatures' dropped by to clean out the candy bowls, and the costumes were creative and entertaining. Then past the deer who were waiting with some impatience to come and eat up the jack-o-lanterns... which were gone by morning. Deer enjoy a treat on All Hallows Eve as well!